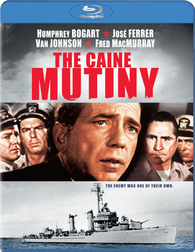 'The Caine Mutiny' Blu-ray Available NOW! The 1954 classic war film starring Humphrey Bogart seems to have snuck under the radar and is now available on Blu-ray! We're used to this with Best Buy exclusives, but according to Amazon, Sony has released 'The Caine Mutiny' on Blu-ray as of September 6! Specs and supplements have yet to be confirmed, but suggested list price for what may very well be an Amazon exclusive is $19.99. You can find the latest specs for 'The Caine Mutiny' linked from our Blu-ray Release Schedule, where it's indexed under September 6.